This Lazy Susan not only serves as an attractive center piece for your dining table, it also makes food and condiment items more accessable. It has few parts and is relatively easy to make. All that is needed is a few basic tools to attach the bearing mechanism. Even the novice woodworker can make and enjoy the utility of this project in less than a week. This lazy susan turntable is not only great for the kitchen and dining room table while sitting down for a meal, but it also works for the kitchen countertop for easy storage and organization. 3/8" x 1" x 19 1/16"
1/2" Dia. x 1 7/16"
Scale railings (C) to the drawing dimension size. 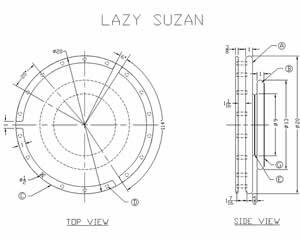 This can easily be accomplished by measuring the print out and dividing that size into the dimension size from the drawing. This will give a multi-factor that can be used to figure the enlargement size for the pattern. Most companies that do duplicating can make the enlargement required for the pattern. Transfer the pattern enlargements onto poster board, and use a pair of scissors to cut out the patterns. To cut the top (A) and the base (B) use a board 1 1/4" x 11" x 72". Joint one edge of the board, and then use a radial arm saw to cut two pieces 21 1/2" long and two pieces 14 1/2" long. Place the jointed edges of the two longer pieces together. Use a framing square and pencil to draw lines across the center and 3" from each end. Use a horizontal boring machine and a 3/8" diameter bit to drill three holes in the marked edges of each board to a depth of 1 1/8". Place glue in the holes of one board and pound in dowel pins (H). Place glue in the holes of the other board and tap the boards together. Use two bar clamps to secure the boards. Allow the glue to dry over night. Repeat steps 3-5 for the two shorter boards. Only two dowel pins are necessary for the shorter boards. Place the dowel pins 3" in from each end. Use a planer to plane the two boards to 1" thick. Be sure to plane both sides. Use a band saw and a circle jig to cut the two boards perfectly round. 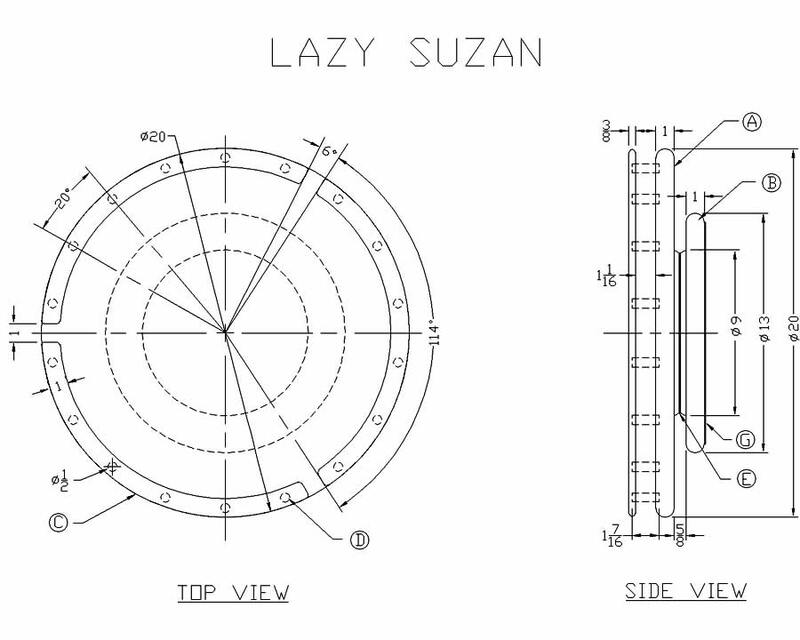 The top (A) should be 20" diameter and the base (B) should be 13" diameter. Use 1/2" round over bit and a hand router to route the top and bottom edges of both the top (A) and the base (B). Plane a 1/2" x 6" x 54" board to 3/8" thick. Trace the railing pattern onto the board in three separate places. Use a band saw to cut out the three railings (C). Use a spindle sander with the largest spindle to sand the edges of the railings (C). Use a vertical sander to round the ends of the railings. Use a router and a 1/8" round over bit to round the top and bottom edges of the railings. Use a large bow compass set at 9 1/2" and draw a center arc from end to end on each railing (C). Repeat this process to draw a 19" diameter circle on the top side of top (A). Measure and mark the centers of the eighteen 1/2" dowel holes on the top (A) and the railings (C). The dowel centers should be 1 1/8" in from the ends of each railing (C) and then spaced 20 degrees apart. The dowel centers should be centered at the top and bottom of top (A) and then spaced 20 degrees apart. Use a drill press and 1/2" Foerstner bit to drill the eighteen dowel holes 3/16" deep in the top (A) and the railings (C). Use a band saw to cut the dowels (D) 1 7/16" long. Use a vertical belt sander to slightly round the edges on both ends of the dowels. Rough and intermediate sanding should be completed prior to assembly procedure. Lightly hand sand with 220 grit sand paper between finish coats. Place wood glue in the dowel holes of top (A). Use a wooden mallet to tap in the dowels (D). Place wood glue in the dowel holes of the railings (C). Align them with the dowels in the top (A), and tap them in place. Use hand screw clamps to secure the railings (C) to the top (A). Allow glue to dry over night. Turn top (A) upside down and center the bearing mechanism (D) on top of it. mark the screw placements, then remove the bearing mechanism and pre-drill 3/16" holes for the self tapping metal screws (F). Center the bearing mechanism (E) on the base (B) and mark the screw placements. Remove the bearing mechanism and countersink the screw holes so the screws will be below the wood surface. Re-align the bearing mechanism on the top and use self tapping metal screws to secure it in place. Align the base on the bearing mechanism and screw it into place. Test the assembly to assure that it rotates properly. Apply a clear finish coat such as Varathane, Polyurethane, varnish, etc. using a pure-bristle brush. Allow to dry 12 hours. Lightly had sand finish with 220 grit sandpaper. If additional coats are desired, be sure to allow the finish to dry completely, then lightly hand sand with 220 grit sandpaper between coats. Allow final coat to dry 24 hours before using the wooden lazy susan. Cut the self adhesive felt (G) to 12" diameter and attach it to the bottom of the base (B). Congratulations, your wood lazy susan turntable is finished and ready to use!